The Corn U Siochain, generaly known as the Sheehan Cup, is presented to the winners of the East Kerry Minor League Division 1 winners. 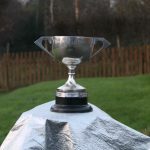 The cup was presented to East Kerry GAA in 1965, by Donie Sheehan, well known and respected Killarney chemist, at the request of the then Board Chairman, the late Brendan Walsh. East Kerry had few Cups/Trophies in the 1960s and Brendy asked Donie to provide a Cup for the Minor competition. Donie, a legend in Dr. Crokes, East Kerry and County circles was the Chairman of Dr Crokes Club for nearly 20 years. He served as delegate for Dr Crokes to East Kerry and for 50 years was their County Board delegate. Prior to the initiation of the ODonoghue Cup competition he refereed an East Kerry final won by Listry. Donie was also very involved with the East Kerry Senior team in the 1960s for approximately 6-7 years, that reached 6 County Finals and won the inaugural All Ireland Club Championship.He was a selector with Kerry teams at all levels, including the Kerry Senior All Ireland side with Mick ODwyer in 1975. Donie was inducted to the East Kerry Hall of Fame in 2010. In 2017 Donie presented the Cup to Dr Crokes joint captains Mark Fitzgerald and James Kelly. 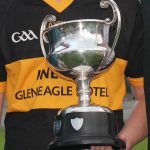 The association between the Gleneagle Hotel (current sponsors of the Dr O’Donoghue Cup, via the Aquila Club) and East Kerry GAA goes back almost 50 years. 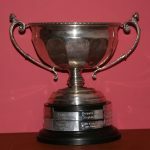 The Gleneagle Hotel Perpetual Trophy was presented to East Kerry GAA in 1970, by the late Maurice ODonoghue during the tenure of the late Brendan Walsh as Chairman of the East Kerry District Board. This Cup was first won, in 1970, by Dr Crokes Club, captained by Michael Sexton. This year it was presented to Beaufort CLG, captained by Jonathan Kissane, winners of the East Region Minor League Division 2 Final. The Corn Noirbhseach Bord Chiarra Thoir is currently presented to the winners of the East Kerry Minor League Division 3. The inscription on this cup is in the old Irish script (Cl Gaelach). Winners recorded on the cup include Firies (2009), Gneeveguilla (2011) and Currow (2015). This year Fossa won the East Kerry Minor league Division 3 title and the Cup was presented to captain Mark Donnellon. As agreed by the East Kerry CCC on Wednesday 13th June 2018 at 8:30pm in Killarney Heights Hotel. Will consist of four teams; Dr. Crokes, Killarney Legion, Cordal/Scartaglen and Tuosist/Kilgarvan. Each team will play each other once in the league. 1st placed team are in the final with home advantage. 2nd placed and 3rd placed teams to play Semi-final with 2nd placed team having home advantage. Will consist of five teams; Beaufort, Fossa, Firies, Rathmore and Gneeveguilla. Kerry U-17 and Kerry U-20 players are excluded from playing in the East Region Minor Leagues while their respective Inter County competitions are being played. A player dropped off the Kerry U-17 and Kerry U-20 training panel of 30 (after Munster final) can play in the East Region Minor leagues with their clubs. If Kerry U-20s are beaten, Kerry U-20 players can play in the East Region Minor leagues. If Kerry U-17 or U-20 Players are not made available MINOR LEAGUE CONTINUES. All remaining rounds and games will be picked up as teams drop out of the County Minor Championship. All games to go ahead as per fixtures, no postponements and if games are not played or teams can’t field, the game will be awarded.